Prohealth Imaging Center has been designated as an Imaging Center of Excellence by the American College of Radiology (ACR) in all 6 Modalities. The ACR awards accreditation to facilities for the achievement of high practice standards after a peer-review evaluation of the practice. Board-certified physicians and medical physicists who are experts in the field conduct evaluations. They assess the qualifications of the personnel and the adequacy of the facility equipment. The surveyors report their findings to the ACR’s Committee on Accreditation, which subsequently provides the practice with a comprehensive report. ACR Accreditation ensures quality care. 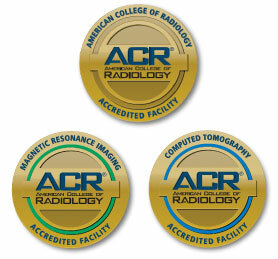 To learn more about the American College of Radiology, please visit: www.acr.org.